I’m not gonna lie: I love urban legends and folklore. I also love local creepy stories about ghosts, witches, and death omens. It’s not the occult that has always fascinated me… but the unknown. And nothing is more bizarre and frightening than the legend of the infamous black dog. No, not the Led Zeppelin song. I’m talking about one of the biggest literary devices in the English language. Heck, it’s even featured in Harry Potter! It’s a common symbol of death, but it may have been inspired by real life events. Right here in Connecticut, in fact! As an English major and reading my fair share of symbolism-heavy books, the black dog has always been my favorite omen. Perhaps it has something to do with growing up near the Hanging Hills in Meriden’s Hubbard Park. I mean, it’s probably one of the coolest legends in the state. What’s not to love about a supernatural canine? With it being so eerily close to Halloween, now’s definitely the time to share the story. The century old legend claims that the Black Dog of West Peak is a small short-haired dog that leaves no footprints and makes no sound, even if it looks like it’s barking. Almost like a ghost. Witness accounts claim that the dog is friendly, but caution that you wouldn’t want to see it more than once. The first encounter results in joy. A second run-in ends in despair. If you see it a third time, death is imminent. At least six deaths have been blamed on the animal. The earliest account of the black dog occurred in 1898 in Connecticut Quarterly. It was written by New York geologist W.H.C. Pynchon. He was out researching the geology of the hillside in winter with his friend and co-worker, Herbert Marshall, and the two began talking about the local legend of the black dog. Pynchon wrote he had to leave his friend behind as he searched for help. He came across a nearby house, but was too frozen to join the recovery party, which was probably for the best. When the local authorities found Marshall, eyewitness reports claim a black dog was watching over the body and it fled as they approached. The story still persists today with those hunting the supernatual claiming they have spotted the elusive creature. Anastasio told CTTrips Blogspot that he was definitely the only person at Castle Craig and looked around for its possible owner. 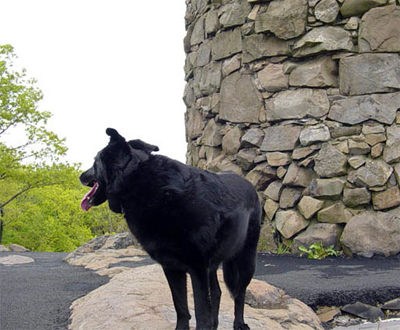 Although skeptics claim that the dog is wearing a collar, or that the photo is staged, or that the dog is not the size as depicted in Pynchon’s written account, it still must have been a pretty dramatic moment for a Meriden local to come across a black dog. So, there you have it, my favorite local ghost story. I think this legend has the right amount of a sense of dread, danger, and mystery. Makes you wanna go hiking, doesn’t it? What would you do if you saw it? What’s your favorite local haunted legend?